The storm had been brewing for days and now it hits! Combined with restless, idle youth and the desire for easy money, something has been released out there amid the darkness, the howling wind, and the rain. 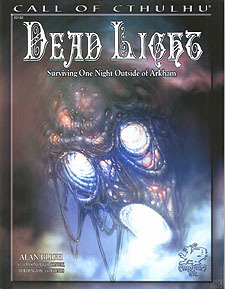 Suitable as a stand alone adventure or as a sidetrack within a larger campaign, Dead Light is set in Lovecraft Country, north of Arkham, during the early 1920s and is ideal for groups of between three and six players.